As you all know from an earlier post that I made, I am a recently converted Anabaptist. I still do not have a church yet, but I am searching. For now, I see myself as an Anabaptist seeker or an “Anarcho-Anabaptist”. Despite my lack of a specific Anabaptist tradition, there is still the larger tradition of Anabaptism that I most certainly identify with. Of course, there is a lot of diversity within that tradition — liberals, conservatives, radicals, and even fundamentalists. All of the branches of Christianity seem to be also present in Anabaptist Christianity. Even with all these different shades of interpretation, there are some common principles that make one an Anabaptist. Two examples of Anabaptist principles were shared by Kurt Willems for Patheos, and I wanted to share them here as well. I think that these two lists make a perfect summary of Anabaptist Christianity, and can help those who find this site understand our stance. In fact, there was recently a comment on this site that said the Young Anabaptist Radicals was “anti-Anabaptist”. It was a very strange comment, and seemed to limit Anabaptism to a very small category of beliefs. So, sharing these principles may help people understand just how broad the tradition we claim is, while also giving them an introduction to it. Over the years here on YAR, discussions about the differences between the approach of the (Old) Mennonite Conference (MC) and General Conference (GC) have cropped up now and again. This comment from AlanS from 2010 is probably one of the most insightful. For non-Mennonites or those who have joined in the last 12 years, these reference are mysterious. Nevertheless, for those of of us working for change in the Mennonite church, understanding these differences are critical. To that end, here is my interview with Lin Garber, the convener of Mennoneighbors and a writer and editor. Lin graduated from Goshen College in 1957 and is a member of The Mennonite Congregation of Boston. Tim: Lin, in a comment on The Mennonite website* you discussed the differering approaches of General Conference (GC) and the “Old” Mennonite Church (MC) to Section III (“Clarification on some issues related to homosexuality and membership”) of Membership Guidelines for the formation of Mennonite Church USA (2001). For those who have never heard of the terms GC and MC, can you briefly explain some of the history? Lin: Today’s Mennonite Church Canada (MC Canada) and Mennonite Church USA (MC USA) took their present forms around 2000 in what was termed a “transformation” (as opposed to discarded language like merger and integration). What had been the Mennonite Church, often informally and unofficially referred to as the “Old” Mennonites (MC), stemmed largely from 18th-century immigrants to North America with Swiss and south German origins. It had conferences in both the United States and Canada, a few of which had congregations on both sides of the border, but the bulk of its membership was in the United States. What had been the General Conference Mennonite Church came out of a movement within the “Old” Mennonites of southeastern Pennsylvania in 1847 that in 1860 organized as the General Conference of the Mennonite Church of North America. A main stated goal of the group was to unite all Mennonites into one body. It grew slowly over the next dozen years as a few congregations decided to join it, but starting in 1874 its membership exploded with the influx of immigrants from central Europe and especially from southern Russia, mostly the Ukraine. The bulk of these immigrants were of Dutch-Prussian (i.e., north German) descent, and those cultural influences came to dominate. At the time of the “transformation” around 2000, the membership of the GC was roughly balanced between the United States and Canada, with the United States having a slight edge. Gladwell is building on the work of economists Ralf Meisenzahl and Joel Mokyr who used this lens to look at the industrial revolution in Britain. For example, they point out the importance of the many engineers who improved on Samuel Crompton’s original invention of the spinning mule. These “tweakers” dramatically improving its productivity through minor changes. At one point, the pulmonologist tried to put a mask over his face when he was deeply sedated… Jobs ripped it off and mumbled that he hated the design and refused to wear it. Though barely able to speak, he ordered them to bring five different options for the mask and he would pick a design he liked. . . . He also hated the oxygen monitor they put on his finger. He told them it was ugly and too complex. 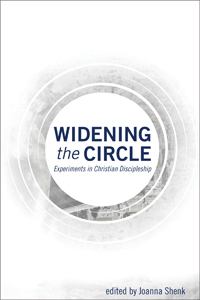 YAR contributors ST and TimN have chapters in the new book, Widening the Circle: Experiments in Christian Discipleship edited by Joanna Shenk, also a YAR writer. If you are near Goshen, Indiana, we’d love to have you join Joanna, Tim and other chapter authors for discussion and a book signing on Tuesday, November 29, 2011 at 6:30 pm at Waterford Mennonite Church, 65975 State Road 15. Last year I had an opportunity to visit eight Mennonite communities in the United States. I talk about it as my get-to-know-the-family tour (I haven’t been a Mennonite for very long). I am discovering that we are quite a diverse denomination. I ended up writing a series of reflections for The Mennonite Weekly Review about my experiences in these different congregations (see the column, Life of the Body).